'Wichita' (Nut photo 95) (Nut photo 96) Orig. by controlled cross ('Halbert' X 'Mahan') made by L. D. Romberg, USDA-ARS, Brownwood, TX. Cross made in 1940, scion budded into bearing tree in 1941, first fruited in 1947, tested as 40-9-193. Released in 1959. 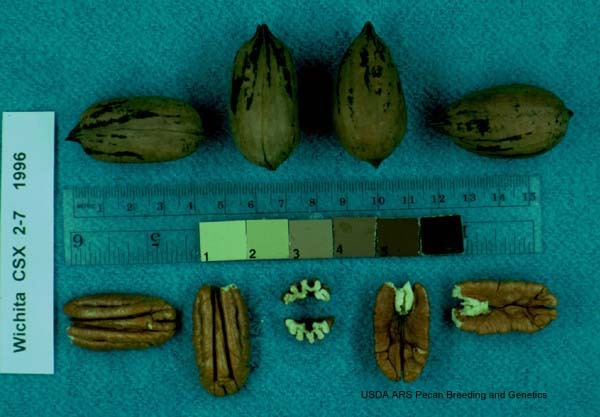 Nut: oblong, with acute to acuminate, assymetric apex and rounded apiculate base; round in cross section; 43 nuts/lb, 62% kernel; kernels golden to light brown in color with narrow dorsal grooves and a wide, shallow basal cleft. Protogynous, with mid-season pollen shed and early to mid-season receptivity. Precocious and prolific. 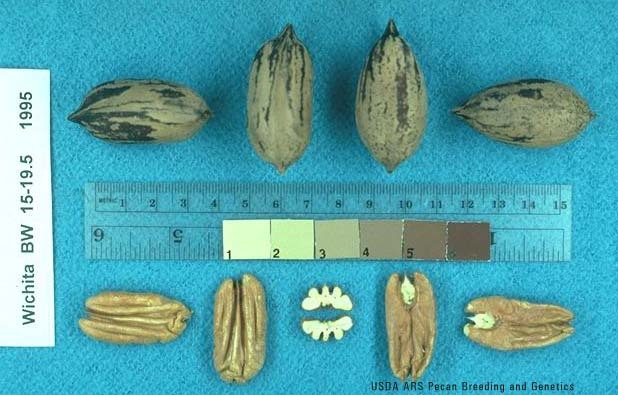 Ripens in mid-season, with 'Western', 4 to 20 days before 'Stuart', depending on location (earlier in SW). Tree moderately upright, vigorous, often with a late flush of growth. Very susceptible to scab. Recommended (1990) in AZ, AR, CA, NM, OK, and TX.